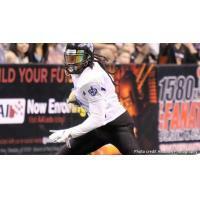 CEDAR RAPIDS, IOWA - The Cedar Rapids River Kings have re-signed wide receiver Javon Bell to its 2019 roster. Bell (6'1, 185) was second on the team last season in receptions (55 receptions), receiving yards (564), all purpose yards (780), scoring (14 touchdowns, 86 points) and kick return average (16.6). He was also third on the team in kick return yardage (199). Prior to Texas Tech, Bell attended Mississippi Gulf Coast where he was a two-time All-American for the Bulldogs, recording 69 receptions, 939 yards, and 10 touchdowns his sophomore season. As a freshman he caught 46 passes for 1,313 yards and 17 touchdowns.